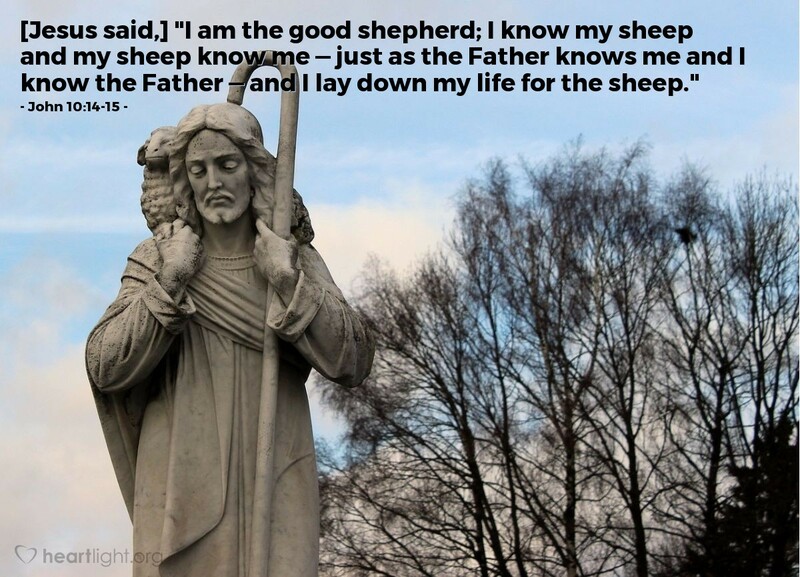 The goal of our walk with Jesus is to come to know him as our shepherd just as intimately as he knows the Father. A key thing for us to remember: In a world where so many people want to attract our attention and are willing to give us advice, we can refuse their voice. We listen to Jesus because he has shown his love for us by laying down his life for us. He is not a hireling, he is the Good Shepherd. Holy Father, you are wonderful and generous beyond description. You have shown your love by sending your Son to be my Shepherd. Help me hear his voice through your Word. Help me hear his voice through the wise counsel of spiritual friends. Help me hear his voice through the words sung to me by my brothers and sisters when we are assembled. Help me hear his voice in the Holy Spirit's work on my conscience. Father, I want to follow your Son as my Shepherd and Lord because I know he, like you, is good! In the name of my Shepherd and Lord I pray. Amen.